The site of Kromdraai B (KB) (Gauteng, South Africa) has yielded a minimum number of nine hominins including the type specimen of Paranthropus robustus (TM 1517), the only partial skeleton of this species known to date. Four of these individuals are juveniles, one is a subadult and four are young adults. They all occur with a macrofaunal assemblage spread across the succession of at least two time periods that occurred in South Africa approximately two million years ago. Here we report on an additional, newly discovered petrous temporal bone of a juvenile hominin, KB 6067. Following the description of KB 6067, we assess its affinities with Australopithecus africanus, P. robustus and early Homo. We discuss its developmental age and consider its association with other juvenile hominin specimens found at Kromdraai B. KB 6067 probably did not reach five years of age and in bony labyrinth morphology it is close to P. robustus, but also to StW 53, a specimen with uncertain affinities. However, its cochlear and oval window size are closer to some hominin specimens from Sterkfontein Member 4 and if KB 6067 is indeed P. robustus this may represent a condition that is evolutionarily less derived than that shown by TM 1517 and other conspecifics sampled so far. The ongoing fieldwork at KB, as well as the petrography and geochemistry of its deposits, will help to determine when the various KB breccias accumulated, and how time may be an important factor underlying the variation seen among KB 6067 and the rest of the fossil hominin sample from this site. Figure 1. 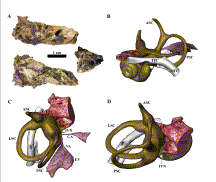 KB 6067 left petrous bone (A) from Kromdraai B and reconstruction of its bony labyrinth (B to D). A, Clockwise, from upper left: posterior medial view of the posterior endocranial surface, superior view of the anterior endocranial surface, and anterior view with a remnant of the bony canal of the internal carotid artery; B to C: respectively, posterolateral, superior and superomedial views of the reconstructed bony labyrinth. Abbreviations: vestibulo-cochlear nerve (VCN), cochlear nerve (CN), inferior vestibular nerve (IVN), superior vestibular nerve (SVN), labyrinthine part of the facial canal (LFC), tympanic part of the facial canal (TFC), lateral, anterior and posterior semicircular canals (LSC, ASC and PSC, respectively), mastoid part of the facial nerve (MFC), endolymphatic sac (ES), vestibular aqueduct (VA), cochlear aquaduct (CA). Figure 2. Inferolateral aspect of the SK 847 (early Homo) left labyrinth as reconstructed from micro-CT data, showing the external length of the cochlea (ELC) and the oval window area (OWA) listed in Table 3. 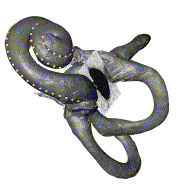 The landmarks representing the ELC are placed from the cupula (apex) to the origin of the basal turn of the cochlea and form 2.4 turns. The OWA is shown on an oblique slice placed to best-fit the complete outline of the oval window.